Ashland Fire & Rescue equips (2) two first out, state of the art ambulances usually staffed with (2) two state certified Paramedics for initial calls. 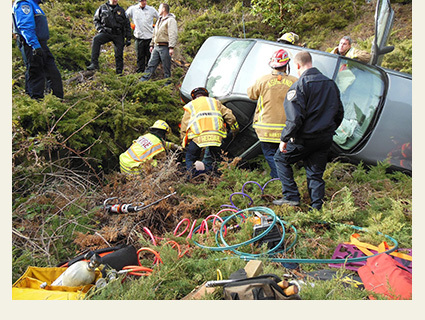 Ashland Fire & Rescue responds to approximately 3,100 medical emergencies annually. Many students and people are interested in a career in the Fire Service and what we do. People have questions about how to go about participating in a ride along program so they can see what we do and what it is like to be a firefighter / Paramedic. Here are answers to some of those questions. 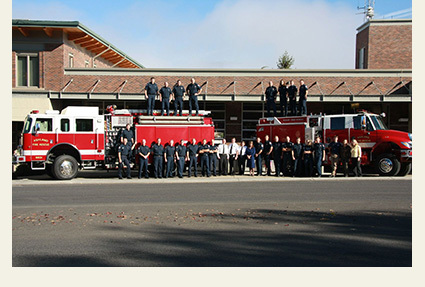 Contact the Fire Department Ride-Along program by phoning 541-482-2770. You will need to complete the proper forms. After the forms have been received, our staff will review the application, and if approved will contact the interested participant. At that time the interested participant will be scheduled for their ride-along. When you arrive at the station for your ride time you will be asked to sign a confidentiality statement. If the participant is between 16 and 18, they must have their parent or guardian sign. All application forms should be submitted at least two weeks prior to a ride-along date. How often can I ride? Ride-Along participants will generally be limited to one ride-along per calendar year for non-students. Staff will work with students to arrange for completion of school requirements. Ride-Along tours will be scheduled between the hours of eight (8) AM and eight (8) PM any day of the week with the exception of holidays, generally be limited to two (2) hours minimum, up to 12 hours, and subject to the discretion of a chief officer or his designee. Firefighter duties are inherently dangerous. Your safety shall be given high priority; however, the utmost importance shall lie with the rider. Riders will not interface with the public, patient or other responders and will follow the directions of the assigned crew. All riders will be provided and must utilize personal protective equipment on every call. A blue or black button down shirt or polo shirt. T-shirts, sweaters, baggy clothing are unsafe and not acceptable. Dark Slacks, black or blue. Skirts, jeans, sweats, leggings, etc are not acceptable. Leather shoes or boots, preferably black in color. Ankle high leather is preferred. Tennis shoes, loafers, sandals, etc. are not acceptable. Fire department dress uniforms from other agencies may be worn with the prior approval of the Training Officer. Dangling Ear Rings, Facial Rings, Excessive Jewelry and other items should not be worn while riding as they pose as a safety hazard. Additionally, perfumes, colognes and strong aftershave should not be used as it tends to make ill patients nauseated. Inappropriately dressed observers will not be allowed to ride and will be sent home. Meal and snacks arrangements will be the participant’s responsibility. You should bring enough food for the time you are riding. You may want to bring money for food/sodas, snacks, etc just in case you do not get back to the station. Due to Constitutional questions of “Right to Privacy”, no cameras- this includes cameras on cell phones, or tape recorders are allowed. Parking is limited to the street side parking in the residential sections around Fire Station #1.